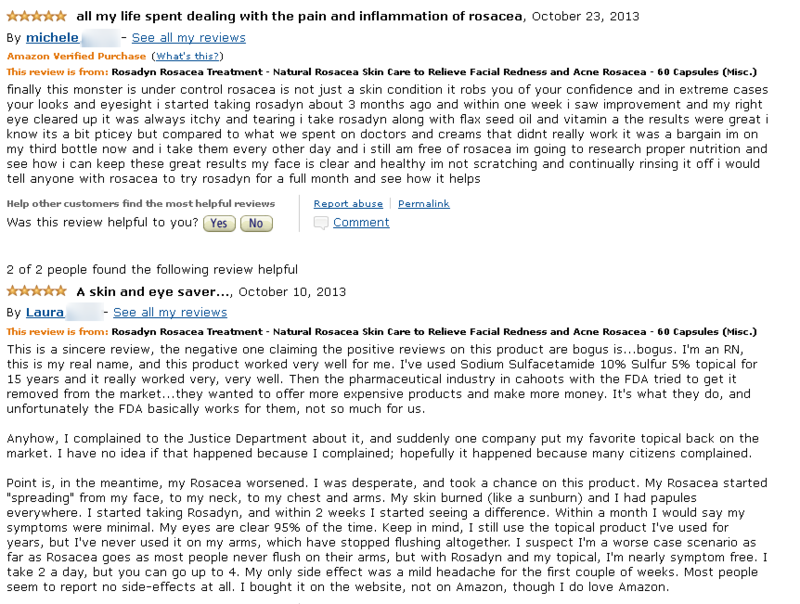 Below we have shared rosacea stories and personal experiences submitted by our customers. 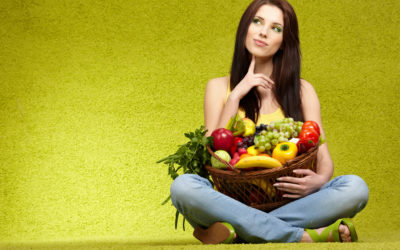 Some have even opted to share their before and after photos or create videos to show their results. Please note that we publish the photos as received with no retouching or editing other than to crop sections of the face to protect the identity of the customer. “My name is Mark and I had severe rosacea for the past 16 years of my life. The worst thing besides the redish and sometime purple appearance is the debilitating burning sensations. I’ve had 3 ETS surgeries and close to 75 IPL treatments with limited success. 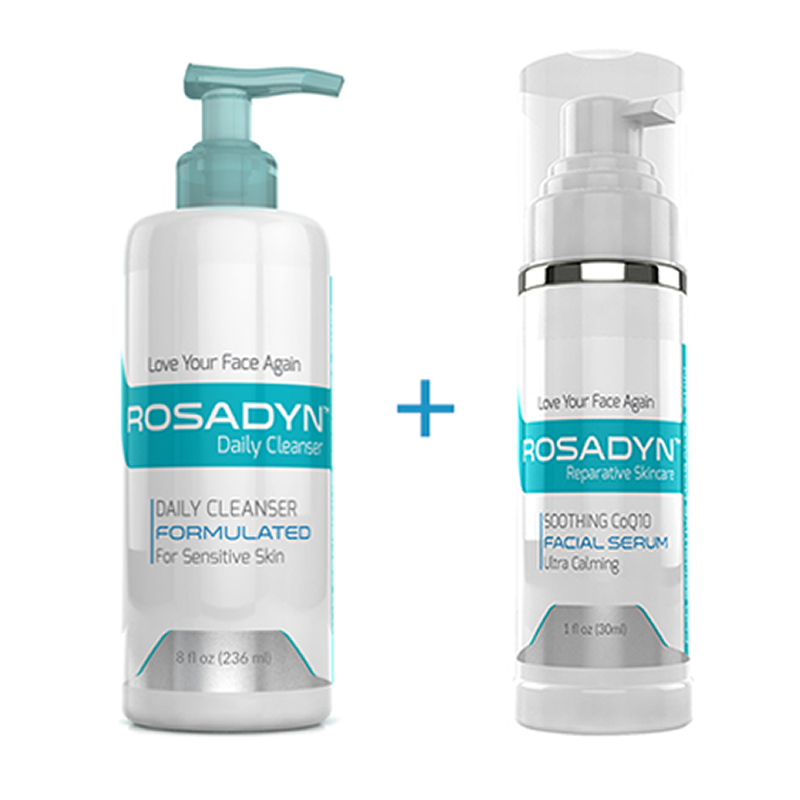 Try Rosadyn+ See Improvement in Minimizing Your Rosacea Flare-Ups, Facial Redness, Inflammation, Acne Rosacea in 6 Months – Risk Free! “Using Rosadyn, as part of a multi-tiered protocol that includes Dermalogica topicals, has proven to have a marked effect on the reduction in redness, pustules, and papules. “I’ve had rosacea for nearly thirty years. I’ve tried every treatment possible including laser treatments. My rosacea severity was classified as ‘rare and untreatable’. My rosacea was so severe that it affected many aspects of my life. My facial redness, flushing and terrible burning sensations interfered with work, relationships and quality of life. As you can see from my photos, my skin was so inflamed that my facial skin often bled and my skin peeled. I could not sleep on my side for years because my skin would bleed through my pillow case and pillow! 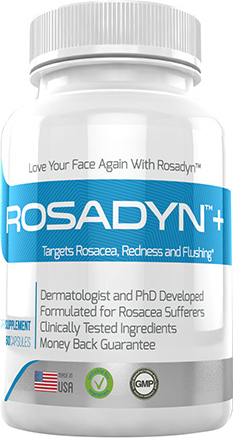 I tried Rosadyn due to Dr. Nase’s reputation as an expert in rosacea treatment and previous help that I received from him on various rosacea forums. 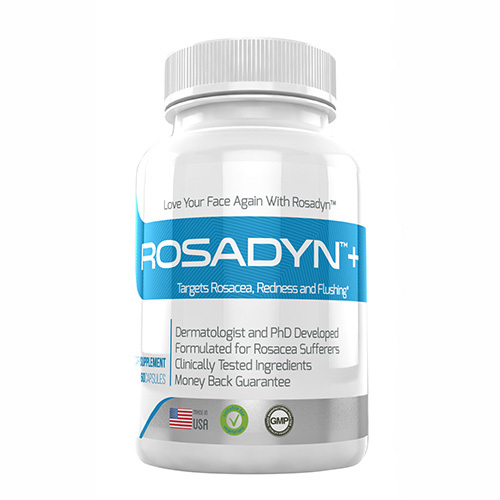 The results were not immediate, but after 4 months on Rosadyn my skin began to heal. My blood vessels started disappearing. My flushing was less prominent. My burning and stinging sensations started to clear. My face no longer bled. 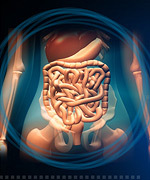 “I have tried many supplements before, most of which are included in the Rosadyn, but did not have any luck with them. They made my facial redness and flushing worse. 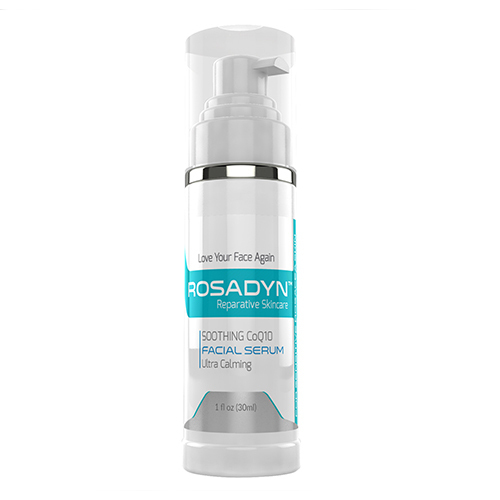 I have been very pleased with the Rosadyn, as I have been able to tolerate it very well and have seen a noticeable improvement in the redness and swelling, after only 3 weeks. I am very happy with the results so far and will continue to use it. 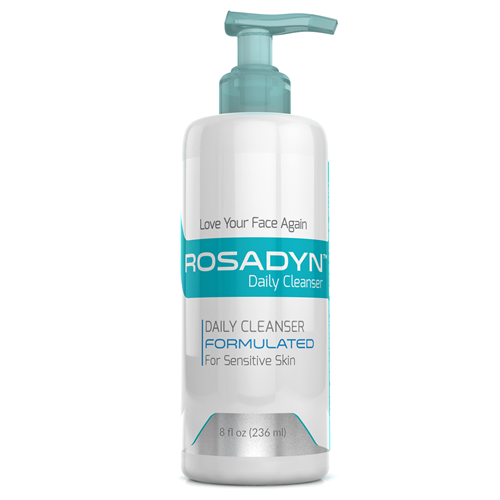 “After 7 weeks of Rosadyn (triple strength) my chronic facial redness is totally cleared. My face is white, calm and comfortable. My son was diagnosed with occular rosacea when he was 5. He suffered terribly with it. 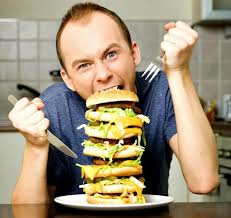 His eyes would swell up and be very inflamed and he could not bear to have any light in his eyes. He would scream and cry for hours because his eyes hurt so bad. He would hide under covers in a dark room and still the pain was unbearable. His pediatric opthamologist offered only antibiotics and steroids-neither of which helped and in fact, seemed to make it worse. 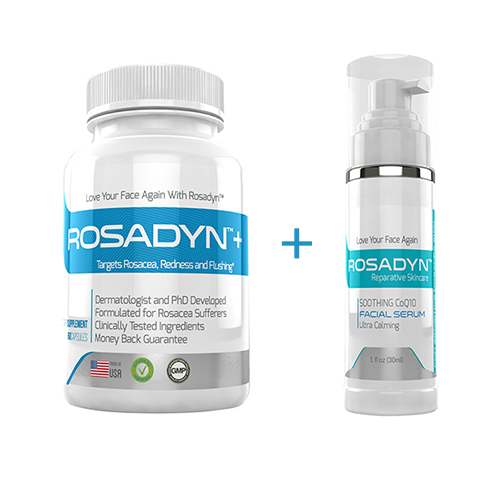 When he tried Rosadyn for the first time, it was like a miracle cure. His eyes cleared right up and he has not had any flare-ups at all for over 6 months now. He has the prettiest blue eyes, and every time I look at him and see those clear blue eyes I am reminded of how great a product Rosadyn is. We are so thankful for this amazing product. Powerful, yet safe enough that a 7-year-old can take it with no problems at all. At his last visit to the pediactric opthamologist, his doctor said he was surprised to see no trace of the occular rosacea! But we already knew that! Love, love, love Rosadyn! 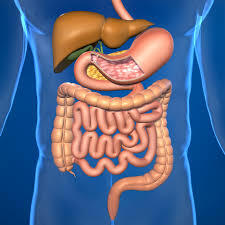 Hi My name is Claire and I have been suffering with this horrid disease for around ten years. I first noticed something different was happening with my skin when I was working part time in a sports centre and the chlorinated air along with the heat in the centre played havoc with my skin. I thought initially that my skin was just sensitive to the area. However as time went on more and more things seemed to aggrivate my skin causing redness, burning , stinging and sensitivity. These ranged from heated rooms, alcohol, stress and anxiety and my beloved sun !Around this time I was also diagnosed with a pituitary tumour which sent me into a downward spiral of anxiety and stress which in turn did not help my skin issues. The more anxious I got the worse my skin got but all I could think of was no more holidays in the sun, no more meals out , what is causing these sensations. I researched online and tried Reiki, positive thinking, meditation which all helped a little but the redness, flushing and anxiety were still there. 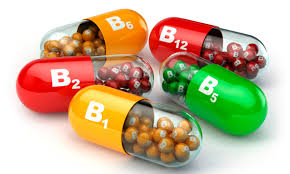 I used a fantastic herb called Rhodiola Root for stress but the Rosacea still kept making an appearance.At its worst my rosacea made me a nervous wreck who could not leave the house in fear of the burning and redness it caused. However things started to look more positive when I purchased Geoffrey Nase book Beating Rosacea online. This book offered me hope. I also bought another book by Georgie Holbrook. I took 6 months off work and dwindled myself off the sleeping tablets that got me through the days. Slowly and surely I accepted the changes that were taking place accepting the fact that I could no longer lie on a beach, drink endless amounts of wine and enjoy lovely meals in restaurants. It was hard but I did it. 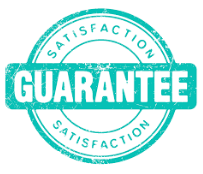 I was then lucky enough to find a practitioner in the UK and undertook a course of Photofacial treatments which had fantastic results with the redness and flushing. I then became pregnant with my first child and although the rosacea was still there it didnt seem to bother me as much. Ironically as soon as I gave birth the rosacea disappeared. I could not believe what was happening. I had had this disease for 2 years and then it disappears. For the next 7 years I lived a pretty normal life however I never went back in the sun but managed to vacate to Singapore, Las Vegas and Dubai. Heated rooms didn’t bother me any more, drinking wine did not make me flush. No more redness no more burning. BUT in August this year whilst visiting Paris I had a massive rebound attack – redness, burning, swelling, oily skin. 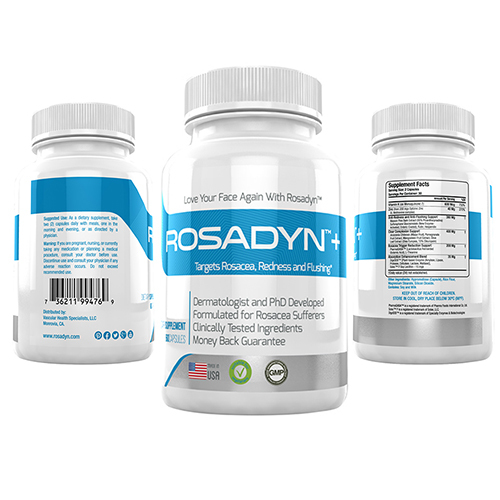 I found rosadyn on the internet and have been using it now for around 6 months initially 1 tablet 2 x per day and now 2 tablets 2 x per day. I have found these tablets to be my life saviour at the moment. They offer fantastic redness and burning relief for me and would recommend to anybody who suffers with this disease to try. 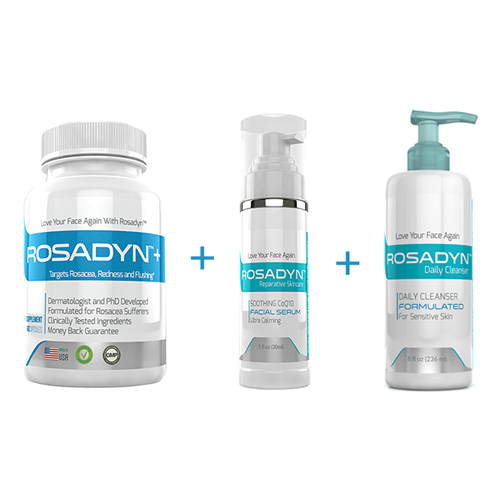 Combining Rosadyn with complementary product results in minimizing of burning and itching symptoms after one month. 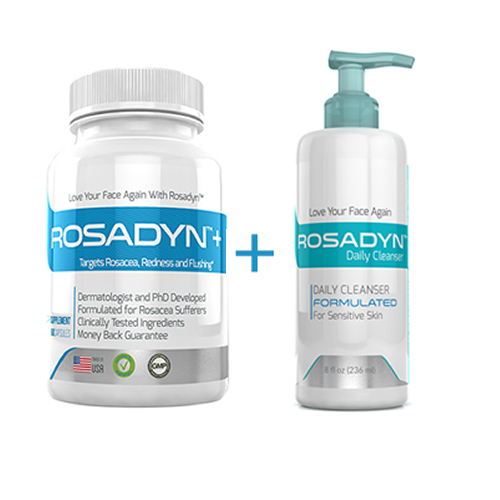 Ocular rosacea tearing and itching symptoms improved with rosadyn combined with complimentary vitamins. 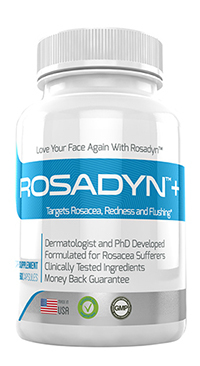 Second review from a rosacea sufferer who’s topical product was removed from the market causing spreading of rosacea to chest and arms.. took a “chance” with rosadyn and began to see results after a month. Fortunately another “sulfur” based topical entered the market and now with topical and rosadyn working together… rosacea symptoms are minimized.